Instant Data On The Go! Mobile computing is growing tremendously as smartphones continue to change our daily routine. The dairy industry is harnessing this technology with PocketDairy forging ahead. 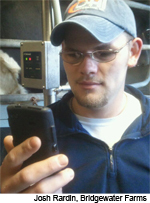 The PocketDairy app provides vital cow statistics for production, reproduction and udder health. A swipe of the screen reveals lifetime health, vaccination and protocol history. 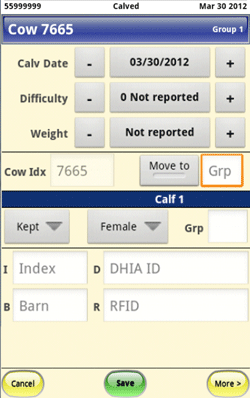 You get unique items like Hold Meat and Hold Milk alerts from PCDART, and you can select which data items appear on your cow or heifer pages (including genomic data). 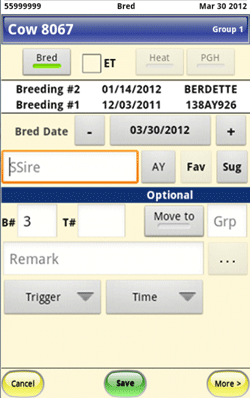 View quick action lists for vet check, breeding, dry off and calving. Filters make it simple to use, even in the largest of herds. Enter data on the go. PocketDairy is not just a fun app for your smartphone or tablet. It's an Android program that gives you the power of PCDART - anytime, anywhere. A few taps will make a group change; add a dry, calving, bred or left date; put in vet check or recheck codes; and much more. With wireless syncs to PCDART, data can be updated as often as needed. To install PocketDairy, you need PCDART version 7.15 or later and your smartphone must have Android 2.2 or later. Your tablet must have Android 4.4 or later to run the Vet Check Maxx feature. Vet Check Maxx was recently awarded a Top-10 New Product at the 2015 World Ag Expo. It is designed for tablets with a 7" or larger screen and will instantly simplify and streamline your vet check days: Vet Check Maxx. PocketDairy is turning heads! With comments from customers like “I am continually amazed at what the program can do” and “It benefits what we do everyday;” it’s time to see for yourself what all the excitement is about! 2011 Innovation Award. PocketDairy was selected as one of the top ten most innovative products of 2011. 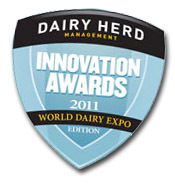 Innovation Awards are sponsored by Dairy Herd Management. Entries were evaluated by Dairy Herd Management’s independent panel of dairy farmers, agribusiness representatives and university experts. 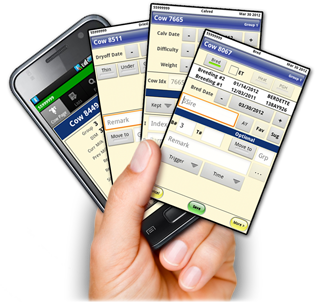 PocketDairy gives you immediate access to data you need to make quick cowside decisions. Information is always up-to-date and always with you. Choose from regular or ruggedized Pocket PC models. Look up information cowside: calving date, days in milk, lactation number, group number, current / previous milk wt., SCC, date to dry, date to calve, days since bred, health information, and more! At vet checks, answer the vet’s questions about a cow’s health history with just a tap on the cow’s identity. PocketDairy can be used on multiple handhelds so all of your key employees can have access to the information they need, no matter where they are on the dairy! Input on your handheld unit: Why write it down and reenter it later? 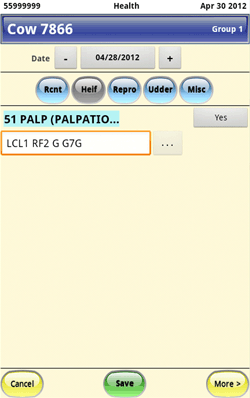 Tap it all right into PocketDairy: cows in heat, cows for vet check, change group number, flag lame or sick cows; even put in calving, dry or breeding dates (recommended service sires are stored). Push one button to transfer the input to your computer or your DHI technician’s computer on test day. Accepts Scanned Identification from RFID tags: Link a portable wand with PocketDairy on the PPC to quickly locate cows of interest in a group, see or hear (!) pending tasks as each animal is wanded. You can quickly find cows turned into the wrong pen or any cows that have a scheduled task. The system complies with National Animal ID System (NAIS) requirements. You must use PCDART and have version 7.15 installed. PocketDairy has a monthly charge of $10 plus 3 cents per cow ($20 maximum fee) and a $30 start-up fee. Contact DRMS or your local DHIA Service Affiliate for more information. Subscribe to PocketDairy PPC for just $10 per month, plus a $50 start-up fee. Contact DRMS or your local DHIA Service Affiliate for more information. A few taps gets you to the information you need. It's quick and easy to view or input data. Enter data one time. Trust PocketDairy and not your memory when you need information on a specific animal. Any smartphone using Android Operating System 2.2 or higher should run PocketDairy and any tablet using Android Operating System 4.4 or higher should run the Vet Check Maxx feature. PocketDairy Android Devices Confirmed by Customers and Support Staff for PocketDairy use. Contact DRMS for recommended Palm devices for PocketDairy use. "The program has helped us be much more efficient in our daily operations. Herd input is more accurate and much faster. Vet checks are easier and we get more for our money with the vet. Making decisions on the spot about culling, sorting, and many other tasks is now very easy. I know that we are making better decisions, and we do not have to run into the office to look up cows every time an important decision must be made. This translates into more profit for our operation through efficient decision making ." "PocketDairy lets us keep track of information on the spot instead of having to write it down and reenter it at a later date. We can record such things as body condition scores, sick cows and cows in heat without going to the office. One of the best features is the cow page, which allows us to view individual cow information while we are out in the lot. Seeing a cow’s history is really important, especially with over 1,000 cows!" "When we got to about 200 cows, we had to do something computerized to better record events and manage cows. I wanted a good pocket computer, because my computer’s at home (which is not adjacent to the dairy operation). PocketDairy really enhances management. Information is available at your fingertips." Bill Grammer, Grammer Jersey Farm, Ohio (350 milking cows).